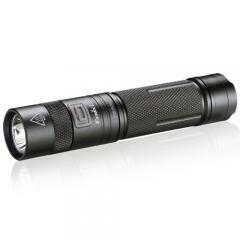 Compact, durable and extremely powerful, the E35 LED Flashlight from Fenix is a must-have tool for any survival kit. Housed in a rugged, aircraft-grade aluminum body, the light boasts an impressive 900 lumens beam with a range long enough to illuminate the length of over two football fields. The simplistic design offers full access to three brightness levels, plus a burst mode. A structurally sound base provides tail-stand capabilities, offering up to 140 hours of hands-free visibility. Machine-sealed O-ring gaskets guarantee a waterproof seal up to two meters, making the E35 the perfect flashlight for any emergency.